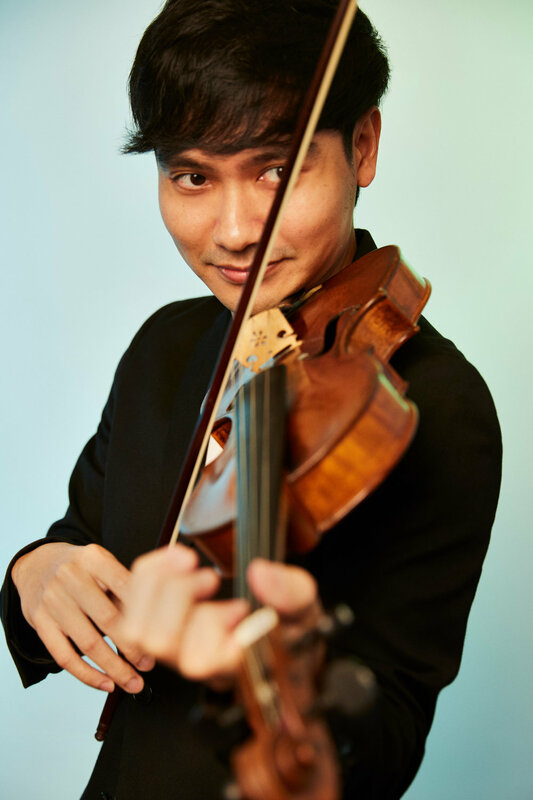 An active soloist in the classical scene, Singaporean violinist Gabriel Lee has performed solo recitals in the United States, Singapore, Malaysia and Myanmar, and has been featured as a soloist with the Baltimore Baroque Band, Orchestra of the Music Makers, PSPA International Ensemble, Peabody Conductor’s Orchestra and the Braddell Heights Symphony Orchestra. Gabriel is sought after as an orchestral musician, having won a first violin position with the Annapolis Symphony Orchestra and freelanced professionally with the Baltimore Symphony Orchestra, Guiyang Symphony Orchestra, Metropolitan Festival Orchestra and the Bangkok Symphony Orchestra. Gabriel's teachers include Qing Li, Victor Danchenko, Ng Yu-Ying, Alexander Souptel, Chan Yoong Han, Zhang Zhen Shan and Jason Lim. As an improvising fusion violinist, Gabriel is a founding member of his multi-genre instrumental band, the Lorong Boys. The group has gone on performance tours to various parts of Indonesia, multiple features on almost every form of mass media in Singapore, performances at the Esplanade, the President’s Star Charity, amongst many others. Gabriel has also collaborated with the Odyssey Dance Theatre, Indian-fusion group Flame of the Forest and fusion pianist Tze Toh, amongst others. Gabriel is also an emerging baroque violinist, having had multiple solo and concertmaster appearances with the Baltimore Baroque Band, frequently appearing as a freelance baroque violinist in the Music at St. Bartholomew’s series, and having also collaborated with UMBC’s Camerata Chamber Choir. He studied with Risa Browder, performed in the Wilmington Bach Festival and the Amherst Early Music Festival, and played in masterclasses with Lucy Van Dael, Ryo Terakado, Julie Andrijeski and Emlyn Ngai. Being a passionate music educator, Gabriel is the Founder-Director of the Philharmonic Society of Myanmar and has conducted masterclasses and coached various ensembles in Singapore and Myanmar. He is currently Adjunct Faculty at the Yong Siew Toh Conservatory of Music and the School of the Arts, and also conducts interactive and innovative workshops in schools with the Lorong Boys. Gabriel has served as a Leader-Mentor for the Orchestra of the Music Makers, as well as violin mentor for the Singapore National Youth Orchestra.